Your Squirrel doesn’t have the patience to sit and listen to the details of the potty process, so don’t bore her with too much instruction and talk. (You can put your chart and pointer away.) Squirrels aren’t likely to be listening — or still in the room — after more than a few minutes anyway. Instead, keep them moving, and allow them to make choices so that they’ll feel in control. Start by introducing your Squirrel to the potty with the “Time to Go Potty Race.” This game is designed to teach Squirrels how to use the potty and also give them a cue phrase for when they really need to go. Should you use a toddler-size potty chair or the regular toilet with a kid-friendly seat insert? It’s up to you and what works best for your Squirrel, but you may find that Squirrels prefer potties because they can pop on and off of them more quickly (and get back to playing sooner). If you’re using the toilet, you can still play the Time to Go Potty race, but you’ll just race to the bathroom. Once he gets the hang of the game with the potty in the middle of the room, try moving it to other spots in the room or elsewhere in the house. Make the game more sporting by having your Squirrel gallop or hop to the potty, or hide the potty in another room and have her go and find it. 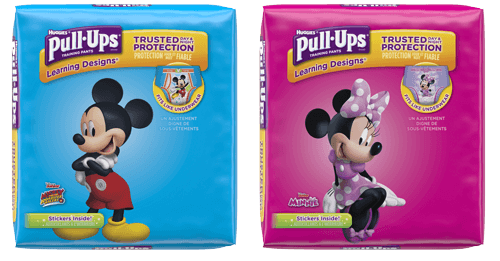 Have your child practice pulling her Pull-Ups® down before she sits on the potty. Once she’s mastered pulling her Pull-Ups down, add some loose pants with an elastic waistband. Sing a potty jingle for your child when he is successful. Keep a Sticker Chart in the bathroom and have your Squirrel add to it for each potty success. The minute Squirrels have peed or pooped, they’re going to want to zoom out of the bathroom, so it will take a little savvy to teach them to flush and to wash their hands. Try turning the flushing into a “superpower,” or a magic act (“I shall now make this poop disappear!”). Hand washing is more fun with foamy soap, or bubble blowing contests. The key to start potty training the Squirrel personality is to keep them moving and allow them to make choices that help them feel like they’re in control. If your Squirrel wants to check out the poop or pee, welcome her interest and talk about attributes such as color, size, volume and smell. This will help your Squirrel learn that pee and poop are natural aspects of being a person, instead of something to hide. Kids also learn from watching grown-ups use the toilet, so don’t be shy about giving a demo. If you’re a dad, uncle, grandfather or other male caregiver working with a little boy, it’s best to do the play-by-play while sitting down. Standing to pee is an advanced skill best left for later in the potty training process. Your Squirrel needs to keep moving. By keeping your child engaged and focused, you’ll help him or her slow down long enough to get the hang of this potty training thing. Your child will feel in control, which is super important for a sense of accomplishment and pride.